Record label shirt design is always fun, but these two arts were very special to me. 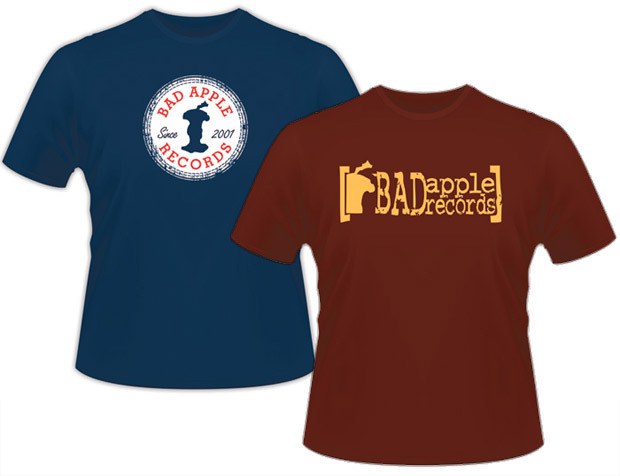 Bad Apple Records printed these shirts to commemorated the tenth anniversary of this seminal independent music label. I have been involved with the label in different capacities since its inception, so it was a no brainer for me to design these shirts. 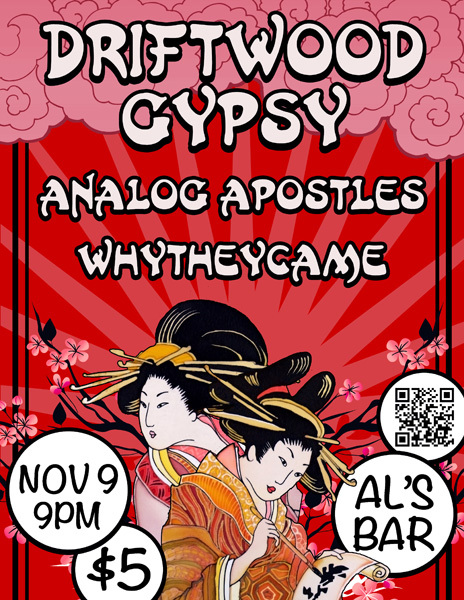 Bad Apple has released records in several genres, including efforts from my previous bands Stellar Kin and Redfoot. Both shirts feature variations on the Bad Apple logo that I designed back in 2002. First, the burgundy t-shirt with yellow gold ink uses the complete “grunge” variation of the logo. This was easy to design. All I had to do was recolor and resize my original mark to stretch all the way across the chest. Next, the navy blue shirt features a parody of the famous Converse Chuck Taylor All-Star shoe insignia. The circular image features a white background. I recreated the stitching pattern reaching all the way around the edge. Then, I typed out “Bad Apple Records” in a Courier style font in red, mimicking the original design. I set “Since 2001” in a handwriting style script. Finally, I placed the full apple core in the center in place of the star from Converse’s original design. All of the blue design elements are actually reversed out of the white circle, as is the grunge weathering. This way, I was able to keep the number of screen printed colors down to two. The label sold a ton of these shirts, and their tenth anniversary show was also a huge success. Are you an independent record label owner? Do you need graphic design for shirts, hats, or hoodies? You’re in luck, because it’s my specialty! Contact me today! I toured with the band Stellar Kin for six years. In addition to writing and performing, I created all of our band merch design. It is a special feeling to know that there are hundreds of these floating around out there with my former band’s name emblazoned on them. This shirt design is one of my favorites. I sought out to use an alternative placement, wrapping around the side, from the beginning. The story of how the artwork came together for this jade green shirt is a unique one. When I lived in Bowling Green, Kentucky, I came home from work one day to find that a neighbor’s home had burned down. Some of the debris had blown into my yard. I picked up a burnt piece of the Bible. It instantly inspired me to create a unique band merch design. Not only did it contain scriptures about how we are called by God to love one another, it was distinctly shaped like one half of a heart. I scanned both sides of the page and simplified it to a simple high contrast solid black. After I mirrored the two sides of the page to form the focal heart image, the phrase “Love never fails, even when we do.” came to mind. It sums up the main idea of the scriptures, as well as a personal mantra for myself. I set this text in a distressed typewriter font across a grungy faux papyrus scroll. 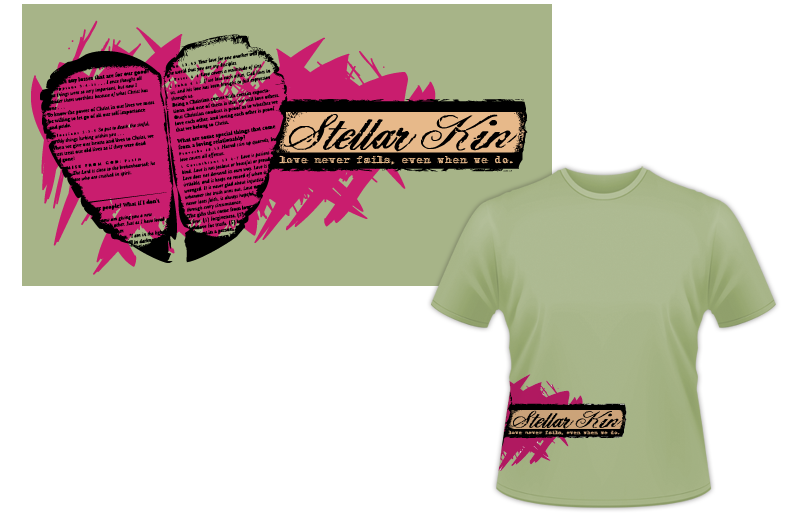 I distressed the band name “Stellar Kin” is as well, featuring it in a pirate style script. Finally, I colored in the background of the art with some hot pink paint swaths to add extra chaos, while still tying the art together. I love working with independent musicians on their merchandise designs. Bonus points for an unusual concept or a random twist on a conventional idea. Contact me today to get started!